The following is an introduction to safety in the long and high jump events of track and field athletics. Track and field athletics are comprised of a collection of sports, generally categorised as running, throwing, and jumping. Of the latter, the long jump and the high jump are two of the best known. 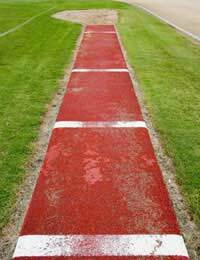 In the long - or "broad" - jump, athletes sprint down a runway and jump horizontally off a raised board into a measured area (usually a stretch of sand), attempting to land as far from the takeoff point as possible. Because the elements are so similar, so too is the training, safety, and required skills. The advantages of readiness for the long and high jumping events include not only maximizing distance and height, but also preventing injury. As in the separate but similar sports of running and pole vaulting, powerful, controlled movements are needed for both distance and precision in jumps. They come not only with the proper and repeated training that leads to mastery of technique, but also with the attainment of background flexibility, strength, and balance and coordination. This means engaging in additional exercises, those that target not only the major muscles of the legs - as in the thighs and calves - but also the feet, ankles, and upper body, including arms and back. Resources for recommended exercise and stretching programs for track and field events include sports texts and journals, organisation and enthusiast websites, coaches, and exercise physiologists. Prior to each training session or competition, joints and muscles should be "loosened" and "warmed up" through a series of stretching and other exercises to ensure safe range-of-motion. Exercises should involve a minimum of the main muscles that will be used during the activity. Clear of debris that could cause tripping, slipping, or impact-related injury.